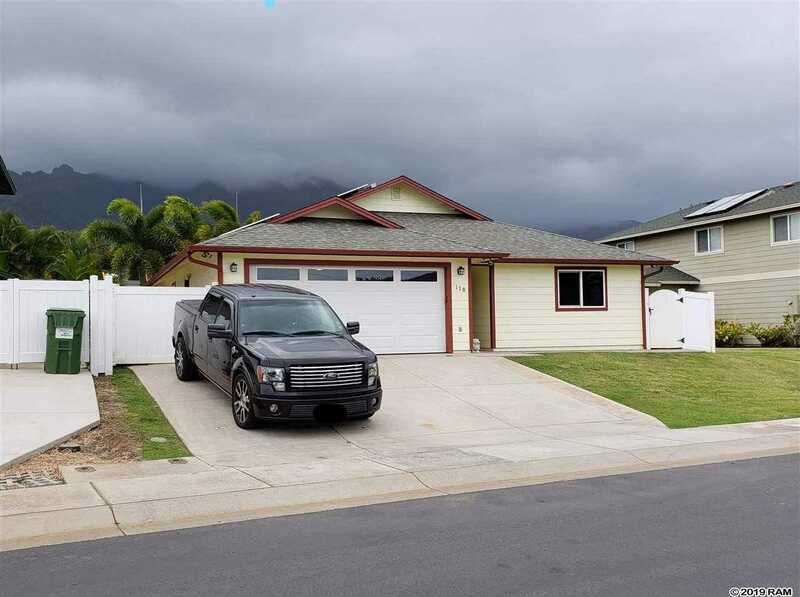 METICULOUSLY maintained Single-story, 3 bedrooms, 2 bath home located in the sought-after neighborhood of Waikapu Gardens. Video to be uploaded soon. This property offers a 22-panel OWNED PV System, Central AC, ADA accessible entry, high ceilings, spacious dining area adjacent to a gorgeous kitchen with brand new stainless steel Samsung Smart Hub Refrigerator, new stove, new microwave, over-sized kitchen island, granite counters, tiled-back splash, upgraded flooring, built-in Bose speakers for surround sound entertainment to accompany the mounted 70 Samsung Smart TV, ceilings fans, freshly-painted exterior and interior, clean 460sf 2-car garage with brand new garage door, fully fenced and gated on both sides of the home, extra parking on the driveway fits 3 more vehicles comfortably, plus room on the side for a small car, watercraft or other toys you may need the room for. Beautifully landscaped with mature palms surrounding the 5-person hot tub with lounger. Sit back, relax or have fun entertaining under the 570 sf uncovered backyard lanai with mounted 42 TV for your outdoor viewing pleasure. Monthly $120 HOA/Maintenance fee includes refuse service. Furnishings negotiable. Call your favorite REALTOR, showings by appointment only. Please, send me more information on this property: MLS# 382101 – $680,000 – 118 E Makaukau Loop, Wailuku, HI 96793.